Order Ritchies Red Wine Yeast 5g from the Stirling Homebrew Shop UK. 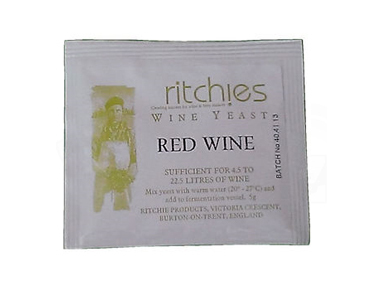 Buy Ritchies Red Wine Yeast - 5g sachet and other Homebrew Chemicals safely online in the UK. This red wine yeast is sufficient for up to 23 litres (5 gallon) of homemade red wine. This yeast produces red wines which are well rounded and full of fruit flavours. Suitable for any style of red wine. Red wine yeast for making your own red wine at home! What a fun and rewarding hobby! As official Ritchies stockist in the UK, we sell genuine Homebrew Chemicals to customers throughout the UK in England, Wales, Scotland and Northern-Ireland. Where to buy Ritchies Red Wine Yeast 5g safely online? Shop at the Stirling Homebrew Shop if you are wondering where you can buy Ritchies Red Wine Yeast - 5g sachet safely online in the United Kingdom. Our Homebrew Shop is located in the UK and our independent store has been serving customers in England, Wales, Scotland and Northern-Ireland since 1976. You can buy our Wine kits, beer kits and Homebrew accesories and other genuine Homebrew Chemicals online and we post out orders to any UK address. Red Wine Yeast 5g - Ritchies Red Wine Yeast - 5g sachet in Homebrew Chemicals and Homebrew.